Anyone that knows me well, knows that if I’m awake, I probably have an open can of Diet Coke nearby. It’s a vice I’ve had since high school, when my step-dad, a diabetic, kept nothing else in the ‘fridge. When people express wonder that I drink it so early in the morning (and so often in the hours thereafter), I compare it to your typical coffee addiction. It’s simply a caffeine carrier, one without calories. My family knows this. Whenever I visit, my mom grabs a case from the store before I arrive. My friends know it, too. They can always count on Diet Coke being stocked in our ‘fridge. Yesterday, I reaped the first benefit of having a semi-public habit. One friend, a friend who shall remain unnamed (just in case this could get him in trouble), stopped by my office with two bottles of Coca-Cola’s newest product, Diet Coke Plus. I hadn’t even heard the rumors, yet, so it was a complete surprise to me. 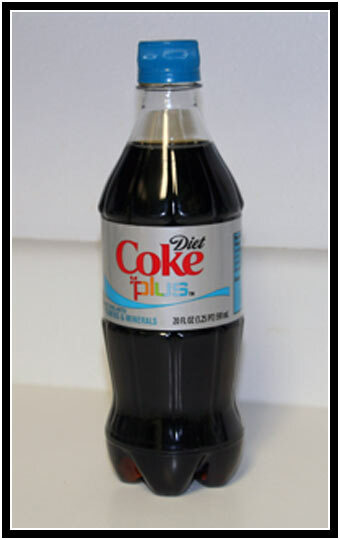 Diet Coke Plus is “Diet Coke with Vitamins & Minerals.” 10-15% of your recommended daily allowance for Niacin, Vitamin B6 and B12, Magnesium and Zinc. Anyway, I thought it was quite cool to be one of the first people (at least in Juneau) to taste Diet Coke Plus; not even my secret friend had sampled it. The local Coca-Cola distributor hasn’t decided if they’ll carry the product or not. They’ve got only one batch, and as far as I know, it may not even reach the shelves. Our market is so small, they just can’t afford to carry every one of the umpteen billion varieties Coca-Cola pushes on us. Which is sad. I could be Niacin deficient.